Computer-controlled, multi-axis assembly robots are the Carpocalypse's forgotten unemployed. Once, they built our cars; now, they sit dormant. What else are they good for? Here are ten jobs that might be a good fit. 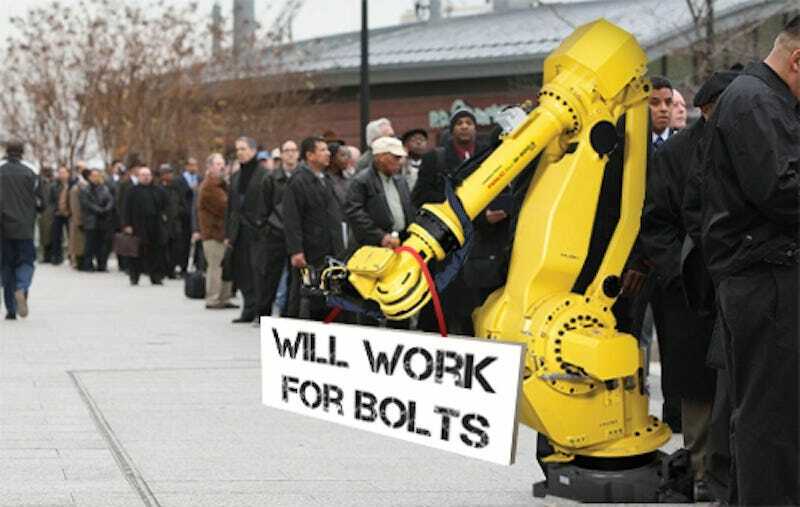 Pity the poor manufacturing robot. Times are tough, and as we were recently reminded, many robots have turned to unorthodox gigs. Consider this a kind of job-placement counseling. Fear not, robots. You'll still take over the world. Repetitive, Programmable Motion: Those lukewarm meat pellets don't cook themselves, kids. "You there! Get back to work! Stop leaking hot oil into my vat of... hot oil!" "And so I says to her, I says, 'Baby, you like some cold, hard SEQUENCE=42 VELOCITY=8J?' And she's all, 'Ooh, piston.' And I'm like, 'Camera one, camera two, check out these glutes.' And then I got fired for doing coke and illegal subroutines in the bathroom." Repetitive, Programmable Motion: Stop. Go. Stop. Engineer One: "You think we can insert code that allows for sass? Engineer Two: "I don't see why not." Engineer One: "What if it gets buggy and rolls off with people still blocking the doors?" Engineer Two: "OH MY GOD THE HORROR — wait, no, that doesn't hurt anyone. Really, why are those guys so pissy?" Yeah, that feels nice. Mmm. Ow, that hurt. OW, stop it. Really, I'm bleeding. Hey! Can you hear me? I SAID I'm... OH MY GOD MY LEGS! AIEEE! Repetitive, Programmable Motion: Tending. Staring at you through your window all creepy-like. Sadly, they do not do windows. Don't ask. Repetitive, Programmable Motion: Spiral-cutting honey-baked hams, not slicing off fingers. This has to have already happened. Have you seen how they cut those hams? It's seamless! No human being could do that, people. Repetitive, Programmable Motion: Waving, looking sad and desperate. Shh! Shh! Shh! Shh! Shh! Shh! Shh! Shh! Note: This has apparently already happened. Repetitive, Programmable Motion: Slow. Stop. Slow. Stop. Leer at breasts of woman in Toyota Camry. Slow. Stop. Slow. Etc. There is skill here. Lunch break! Repetitive, Programmable Motion: No comment. Ah, the joys of a dab of oppo and we had a splendid time I highly recommend it can you believe we were allowed to go on this wonderful sponsored opportunity of a lifetime when my editor asked I said yes I mean really who wouldn't the car is metaphor fast and understeers too much and the interior is a little cheap and disappointing but this vehicle is the best in its segment just not as good as the one in Europe the last one was crap oh no I don't actually own a car did you try the very expensive wine IT'S SUPERB.